Welcome to the monthly report where we collect updates from our studios around the world into a single comprehensive place to summarize the various progresses (and setbacks) they’ve experienced. Last month we debuted our new style of Monthly Report, utilizing the weekly Studio Reports found in Around the Verse to create an overview of progress made in the last four weeks. In addition to our continuing progress with Squadron 42 and the PU 3.0 undertaking, we released both 2.6.2 and 2.6.3 to the entire community, and have now focused those attentions to the upcoming Star Citizen Alpha 3.0. With that, let’s review some of what each studio did this month. The ship team spent a lot of the month working on the Drake Buccaneer. Art created a custom dual weapon mount and generated all the LODs, while the tech content team implemented UV2s and Damage. Tech design made their flight balance passes to get it ready for flight with sound and then passed it along to VFX. The ship team has also made a lot of progress on the newly revamped RSI Aurora. The whitebox phase in now complete, which includes a proxy layout of the space, establishing the animation positions, placing the screens, and making sure the characters could hold the controls. The final geometry of the cockpit has begun in an effort to improve the inside of the ship. Now that tech design has implemented all the art updates into the ship’s new archetype, the RSI Aurora is heading into greybox. The tech design group completed the design for the Multi Function Display (MFD) screens, which controls power, heat, coolers, shields, weapons, countermeasures and missiles, in preparation for Item 2.0 functionality. These designer prototypes are meant to help understand what’s needed and see how everything will interact with each other. As soon as these designs have been approved, the UI team will create an interface to take advantage of the functionality that engineering is implementing in the back end. Once this system is in place, a ship that is staffed by a knowledgeable crew will be able to operate their ship beyond the default system settings and min-max the various ship systems to suit not only a player’s style, but potentially save a player during a potentially devastating attack. This month QA aided LA Development by checking a variety of fixes for 2.6.2 issues. They also provided support to Austin QA with PTU & LIVE sanity checks, smoke tests, sweeps and deployments, and helped new hires get up to speed with the game. As for feature work, the team swept ship destruction VFX, Item System 2.0, implementation of recent loadout changes, and tested multiple iterations of new targeting and ESP code. For a quick reminder on Quality Assurance terms, a Sanity Check basically ensures that the game loads. This is now automated, but can take about an hour or two to investigate any errors that arise. A Smoke Test checks the basic functionality. This process takes 6-8 people about a day if there aren’t any major issues. A Full Sweep means checking everything possible, a process which requires a much larger team and can take over a week. Full Sweeps are the most arduous, rigorous, and intense, but also incredibly important. The engineering team started a new shop entity that uses DataCore components to allow shops to be easily streamed in with object containers, with the aim to be finished in the next sprint. The plan is to make shops more dynamic and reactive to the economy by retrieving their inventory from the back end. The engineering team added a new attribute to vehicle XMLs that allows designers to specify the interior grid type of the vehicle (small, medium, or large). This optimization will reduce memory storage as all ships previously defaulted to medium size. As discussed previously, a new Light Group entity was developed, equipped with a state machine to serve as the ultimate light switch. Now that implementation of the core state-switching functionality is complete, the next step is to start using the Light Group in our vehicles and environments and replace all instances of the old layer-switching method of light management. This new light group entity reduces the number of lights used, which has dramatic impacts on performance. For example, hundreds of entities were reduced down to 90 or less with no visual impact on the Drake Caterpillar. A framework is being developed in IFCS (Intelligent Flight Control System) for the autopilot to handle situations like take-off and landing sequences. This also applies to AI control, so they’ll be providing the AI developers with a set of tools for controlling the ships, like a “move-to”, “change speed to”, etc. This will improve the stability and predictability of ship motion under optimal conditions. The Room System and Atmosphere Containers were updated with several new features, better debugging tools, and several bug fixes. The room system has only been implemented in a few locations, but these changes will allow the implementation of rooms and atmospheres throughout the various locations and ships in the game. At the moment, the entering and exiting of airlocks are scripted events. They don’t factor in atmosphere of any kind. This new system will be able to replace this setup with an actual room and atmosphere that allows for a dynamic experience. In addition to the room system changes, a new feature allows the designers and artists to set wear and dirt parameters for loadouts. This functionality comes in two levels: overall and individual values for specific items. Wear and Dirt values are used by the render node to set shader parameters that make items look old, dusty, scuffed up, and burnt out. This task also used Loadout Editor side work, where the team added UI support to edit wear and dirt. Recently, the team started on the Entity Owner Manager. This system will be responsible for managing ownership and lifetimes of all the entities in the game and is a core feature required to take gameplay from a multiplayer game to a persistent online experience. It will work in conjunction with the back end persistence systems to indicate dynamic changes to the world that need to be tracked and persisted across sessions. The Entity Owner Manager will also work with various game and engine systems, including Debris, Salvage, Criminality, Streaming, Missions, Cargo, Shops, and more to help create the persistent experience across clients and servers. The team has been working on scanning subcomponents, which required some slight refactoring of the object databank. After the changes, the databank can support the storage of “child” entries, which will be the subcomponents on ships/players/etc. In doing this, the thread safety of accessing data within the databank was also improved. This allows calculations to be moved onto other threads, which will help improve performance. This focuses on two big elements: the ping component and angle of focus. The ping component is the method in which a player or pilot will send out a wave to see if there are any objects of note within their scan range. This could be a ship, an asteroid, or even traces that mark whether a player entered or exited quantum travel. Since other players can detect these traces, we think that this could have some pretty heavy game implications. For example, if you were an outlaw, it would allow you to track potential prey. Angle of focus allows players to adjust the angle with which they’re scanning. A smaller angle will also provide more range, but only contacts within the angle can be detected. The underlying radar query logic is being refactored to use zone queries rather than a huge iteration of registered radar objects. This will make the scanning system much more efficient. Since the tech content team supports and implements every pipeline within Star Citizen and Squadron 42, one of their main focuses have been performance improvements. For instance, the team changed the mesh vertex and position formats, which massively improves streaming of these meshes as well as reducing build size.They’re also improving the Python integration within our editor, which allows for faster development of Python tools which are used by every department across the company. The tools can script any sandbox process they want. For example, it can place asteroids and generate modular outposts, which saves a tremendous amount of development time on otherwise tedious and time consuming tasks. The tech content team completed a character animation tool that tracks and reports the number of various wild lines each character will have in the universe. With over 1200 pages of script for S42, which include all story lines as well as wild lines, a tool was needed to continuously generate reports on how many were completed and what was left to solve. Once the various lines are all in, the system will be able to pull lines based on player action and situation, but also randomize the potential wildline responses so the NPCs aren’t repeating the same line every time. All helmets have been converted to a dot skin format. The conversion was important to allow a unified LOD ratio across the character skins. This means no more helmet-less people running around the ’verse. To ensure this is easier in the future, Tech Content also created a tool that rigs skins and exports automatically which will drastically reduce dev time from an entire day to just a few minutes. Heads were also successfully converted to use the human skin shader developed by the graphics team. Since there are 44 different areas of blended wrinkles and blended diffuse, the texture cost was quite high, at about 100 MB per head. With this change, roughly 90% of the original texture memory cost was saved without discernable visual impact. With the implementation of the female character progressing rapidly, thousands of animations have been transferred from male to female to complete her motion set and provide a data for animation to iterate on. To help the cinematics team focus on content needed for Squadron 42, a tool was written to allow for visibility of scenes before they even hit the engine. This allows for fast exporting of animations and preview renders which are then automatically uploaded to Shotgun. This makes it easier and faster to review the many hours of cinematics for Squadron 42. The narrative team has been developing some additional 3.0 missions. They’ve also begun documenting posters and props to populate the world of Star Citizen. The team also created an equivalent Time Capsule approach for the Xi’an history from birth to present day as a means of expanding Xi’an history and society documentation. Breakdowns of ethno-groups in the Star Citizen universe has been in progress to take full advantage of the character customization technology 3Lateral showcased at GDC a few weeks ago. The character team is working on the ingame mesh of the Heavy Outlaw. Next, it will go onto rigging and implementation. The light, medium, and heavy female marine armor and the undersuit has been sent to rigging and implementation. Once the male base suits were done, an adjusted wrap technique was used to save development time. We’ve also made progress on the Female Explorer suit, which has now moved through the high poly phase, so she’ll be exploring the universe in no time. On the Squadron 42 front, both the EVA deck crew and the Marine BDU have gone through the high poly phase and are onto the in-game mesh and texturing phase. We’ve continued developing the Vanduul and the medium and heavy versions of the OMC outlaw faction. Lastly, the mechanized Titan Suit is in R&D along with other alien concept sculpts. The ATX Design team focused on getting 2.6.2 out the door, which has mainly consisted of adding new subscriber flair items and fixing some minor bugs. Additional shop-related elements have been updated as the shopping system continues to grow. The team is also in the process of revising the Stanton System Map. Also, Landing Zone AI and Usables are undergoing additional development. New subscriber flair will be rolled out in the coming months. One of the new items is called the ‘viVid Display,’ which can display game locations holographically. 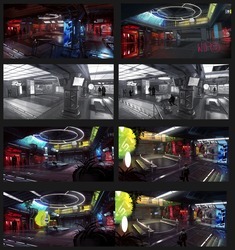 Players can use the ‘viVid Display’ to find out more about locations, including their intended visuals. Other flair items include a series of ship schematics, which will showcase the level of detail that goes into ship design. These light board displays can be hung from any poster style port in your hangar. The Shopping System will be revamped in our next release. As the Item 2.0 system advances, the Item Port structure has been changed as well so it can fall in line with the end goal. These fluctuations have re-addressed things like how Shop Mannequins and Item Bundles are set up. The team’s goal is to create a base mannequin object that the shopping system can apply loadouts to. The items on a given mannequin would be purchasable by themselves, or as a bundle for a discounted price. In the past, every outfit was only purchasable as an entire set of items. On top of that, a bespoke mannequin setup had to be generated for each unique outfit display. Fortunately, advancing tech will soon allow the Loadout Editor to quickly create various item combinations within a given shop. That loadout, comprised of items in the shop, will then be assigned to the shop’s inventory as a “Bundle.” The Shopping System will then spawn these bundles directly onto an empty shop mannequin with no additional effort by the designers. A process that took hours will soon take minutes, allowing different item combinations to be quickly generated for display on the mannequins. While this might seem like a minor change, this will actually unlock a multitude of options for the design team to create realistic shops. The PU Animation Team just finished a small Mocap shoot using the in-house OptiTrack system. This was a pickup shoot to help fill in all the gaps from the Performance Capture shoots done at Imaginarium studios and captured transition animations for both male and female characters. These animations included sitting down at tables with trays, going through the chow line, eating, drinking, rummaging, or sitting in cockpits and turrets. A Usable is an object that a player or NPC can interact with like a chair, wall, table, or any other set piece, but also include props such as cups, plates, bottles, crates, and anything else that can physically picked up by a person. Obviously, animation can only get these game assets so far. The biggest challenge right now is making all the usables function in game. It is up to code, tech and designers to make them work, which is why Austin Animation is working closely with our Frankfurt and UK studios. The team also amended metrics for door control panels, bathroom toilet facilities, and chow lines in the Idris mess hall. Tech is being put in place that will allow an NPC to navigate to a usable set piece and perform a variety of actions (like grabbing a usable prop off the set piece, setting other usable props onto it, walking away with the prop, going to and interacting with another usable set piece, setting usable props on top of usable props, then getting up and navigating to a third usable set piece to dispose of the usable prop with all the usable props on it). Once this one test case is fully functional, we will be able to use these universal animations with different usables throughout the game. The Ship Animation team has finished the major animation tasks for the Drake Cutlass Black. Characters can now enter and exit the pilot and copilot seats properly. For the copilot, the team used a new cockpit template called the “Stick.” This template positions the player in a pose like that of a helicopter pilot which was required to fit the new geometry of the Cutlass cockpit. DevOps added additional logging to better track issues and allows the team to dump the status of the users download session at the moment they experience the issue. The DevOps team then works directly with the Community Relations team to debug the issue or issues the user is experiencing. A great example of this is the latest version of the Patcher. As some of the Windows 10 users may have already noticed, the 2.4.9 version of the Patcher brought back music that had been missing. The exact cause of the issue was that the Windows 10 sound settings were set to 192kHz which caused the Patcher to crash if you had the music turned on. You can now enjoy all of Pedro Camacho’s music again! The QA Department has been heavily focused on 2.6.2 testing. With the addition of Multiplayer Megamap and Serialized Variables, multiple cross-studio playtests between the ATX and UK studios were performed in order to check for any unexpected behaviors, such as increased desynchronization and lag between clients, massive performance changes (good or bad), and crashes. Since the new Drake Buccaneer came online sooner than expected, we were able to perform frequent testing to ensure the ship was operating as expected for its inclusion in 2.6.2. In the development stream testing, Squadron 42 testing continues, as well as a range of tests with ground vehicles on planetary surfaces in a multiplayer environment. Various development tools are also being tested, such as the Procedural Planet Editor (PlanED), and the Subsumption Editor. The Player Relations team was very busy in both the US and UK this month helping with 2.6.2 and 2.6.3. We spent a lot of time with Evocati and QA working on getting the final bugs worked out, then managing our public PTU playtests. In the coming weeks, we will be increasing and updating our PTU test numbers, so we’ve spent a lot of time working on how to roll that out, too. Lastly, we also had a great summit in LA with other department leads and stakeholders to work out our plans for the rest of year, and we got to spend a little time working with our Turbulent friends as well. The player interaction sprint is proceeding at full speed. Rather than outlining a whole mesh, they have created a system where sub-objects can be highlighted allowing players to choose individual parts. This is especially useful in cockpits, where players can interact with individual buttons and switches to access things like ship functions and resource distribution. The team has also been ensuring the new interaction system works seamlessly with the multifunction displays (MFD). The new placement system has also come online, so players can choose where and with what orientation objects can be set down. If the placement position is out of range, players now automatically go into a throw state. Different actor states have been added to the Player Status System, so the player finds it harder, or even impossible, to do things like jump, vault and mantle depending on how fatigued they are. Mass has been added to the suit and weapons as another way to influence the player’s stamina. We’ve also added a breathing state component to bring together the player’s status with the procedural breathing animation and sound. The team is now starting work on new gameplay elements like suit punctures, oxygen recharging and depressurisation.The team invested time in the conversation system tech by creating a tool to help simplify complicated conversations when there are multiple actors in the same scene. The UI team began the front-end skeleton framework for Kiosk shopping. This includes properly setting up all UI components such as lists, grids, buttons, TextFields, and other various assets. Once this is done, the engineers will hook these components up to the game data and get it presented diegetically in the game world. The team is also supporting the player interaction system to unify the way the players will interact with in-game UI screens across the game. This means the same underlying system used to interact with a MFD in a ship seat will be applied to all in-game terminals, wall-mounted displays, and kiosks. This will make interaction with in-game displays feel much less clunky and constrictive. In anticipation of the Graphics Team’s work on the new render-to-texture (RTT) tech, the UI team has done a round of testing using current helmet interiors to see how well the UI looks rendered onto an interior glass surface.The new RTT tech will eventually allow the UI to render properly in the rendering pipeline, making it feel much more integrated with the game-world than it is currently. They have also checked how well the text will read at various sizes and how any post-processing effects, such as motion blur or chromatic aberration, might potentially negatively impact the legibility of the text and symbols. The UI team is also looking at potential impacts the new incoming dynamic field of view system might have on the UI. This new system will allow such things like the HUD and 3D helmet interior to remain roughly the same size on screen when setting a lower or higher field of view. The Audio team has been involved in all gameplay features like the Buccaneer, surface outposts, Squadron level development, and the actor status system. Work has continued on the Audio Propagation system to make audio respect walls, doors and paths. In the current system, audio triggers play from their point of origin and either being occluded or un-occluded, but always play from their source position. The new propagation system will allow a sound playing inside a room to be heard by anyone listening from outside the room, either through the door, window, or any other opening. This extends to other rooms, so a sound playing 4 rooms away will navigate the doorways and the air in between in order to reach the listener. Also, the first and second pass of the mix management system have been completed. This is a virtual mixing console that can be applied to certain areas or rooms and allows the creation of mix snapshots that can apply volume, filter or effect settings on any parts of the audio mix with faders in DataForge that can be tweaked in real-time. Setting up and organising these areas, and mix snapshots, will allow for easy adjustment of the audio mix. Finally, a lot of progress has been made on the WordUp dialogue tool to manage the huge amount of spoken lines in the PU and S42. For fun, here’s a piece of original Star Citizen music called Atomos for you to enjoy. The Concept team has been finishing the Gemini ballistic shotgun and establishing the look of a new ship weapon manufacturer, Preacher Armaments. Preacher prides themselves on making high-quality, reliable and effective weapons that are favored by bounty hunters, police, and militia. In 2940, the conglomerate Eon Group bought out Preacher from founder Kino Walton and immediately ramped up manufacturing. Preacher Armaments is aggressively making its way into stores across the universe. Concept work for the Banu Defender is complete, as well as on two additional ships that will be revealed in the future. Work continues on the truckstop interiors, satellite interiors, New Babbage on microTech and dressing for the modular habitation modules. Here is a glimpse of a WIP Truckstop interior. Truckstops will serve as waypoints for haulers and other travelers making their way through the system giving them a chance to restock, refuel, and stretch their legs. The environment team has been refining the surface outposts with technical, engineering, and habitation spaces coming together with their preliminary dressing passes. The exteriors are now mostly complete. The team is also looking into lighting variations for the procedural system to add more complex setups for the lighting states. The greybox for the truckstop space station is continuing and now that all the building set pieces have been established, the detail phase has begun. On the Satellite sprint, we’re close to being Whitebox complete on the communication archetype, which means the modules and classifications that were specified by design have been visually explored. Our ship team has been continuing work on the Hull-C and Reclaimer, which includes the new light controller work that allows for easier set up of different lighting entities and switches them between property states (e.g., on, off, emergency) depending on various circumstances such as a player interaction or sufficient pull from a connected power pipe. The Javelin continues to be polished for both Squadron 42 and Star Citizen. The team is also completing the capital ships of the Vanduul Fleet. As you’re aware, the VFX was completed on the Drake Buccaneer and the ship was released in 2.6.2. Meanwhile, the RSI Constellation Aquila is going through its flight-ready pass. The MISC Prospector finished a thrusters first pass and damage R&D blockout. The new GPU-driven thruster trails have completed its initial implementation phase. On the Weapon VFX side, the style guide has been improved by bringing in a new system that defines the visual style of a weapon based on manufacturer and energy type. The Apocalypse Arms Scourge railgun, Kastak Arms Devastator plasma shotgun rework, and Klaus & Werner Gallant energy rifle rework finished their first pass. The layered impact library has been rolled out. Previously, impacts were per weapon and per surface type, but the new setup allows us to layer up individual elements which gives more flexibility and less maintenance. The animation team has been exploring a lot of technical previs this past month. Part of that work includes improving the functionality of the shouldered weapon state to get the railgun ready and playable for 3.0. The team also polished the prone set so it will be ready for code to work their magic on fixing any edge cases and continued to work on Breathing & Stamina to create a solid look and feel for a player breathing across multiple states, such as normal, tired and hyperventilating. The weapons-free jumps are getting a pass to bring the animations more in line with the mocap rather than the technical first pass implementation. The Devastator shotgun, Gallant, Arrowhead, and Railgun weapon reloads have been improved. Meanwhile, the Derby Studio continued with Facial animation for SQ42 and Star Citizen cinematics. They attended a facial shoot down in London for 3.0 and members of the team visited the LA studio for some facial animation R&D meetings. This past month, we completed all the rockets and rocket pods ranging from size 1 to 3 as well as the first art pass for the Knightbridge Arms Ballistic Cannons. The various sizes can now be used to test out the new modularity system and various upgraded levels and combinations. The FPS weapon artists finished a second art pass on the Klaus & Werner Arclight II, Gallant, and Arrowhead which now include new venting mechanisms that add more visual interest to the reloads. The first art pass on the Kastak Arms Ravager-212 and a second art pass on the Kastak Arms Devastator with an additional layer of detail was also completed. The lighting team began determining a way to integrate lighting on modular surface outposts, so it feels coherent across potentially countless outpost layout permutations. The challenge with this task is that every room could have a different arrangement of props and objects, which dictates where lights would logically be placed, as well as the theme or mood of that room. 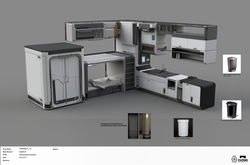 For example, crew sleeping quarters should have a different mood than a hydroponics lab. To do this, the lighting team tested for possible issues (such as light leaking through walls or certain lighting variations looking incorrect when placed next to others) by integrating simple lighting variations into the procedural system. The team also focused on creating a visual target for our main room types (habitation, hydroponics, mining, and storage) to see how far we can push the lighting to match our concepts and goals for the interior look of our surface outposts. When these are finished, we can then determine how to break the lighting down into modular components that can be fed back into the procedural system. The tech art team worked on multiple skinning tasks, including clothing for both the PU and SQ42 (to widen the range of character customization) and a skinning pass on the final Vanduul mesh (so the animators can work on their animations).The team created a tool that allows the team to quickly update the exact grip placements for individual weapons. Artists can now use a reference mesh, create an offset, hit export, and immediately see their changes live in engine. This will allow them to iterate much quicker than before. In addition, they developed a tool for the animators to redirect their walking animations to turn animations. This fairly simple tool that will ultimately reduce the time the animators need to spend on certain specific animations. The Level Design team worked on the modularity of Space Stations and Surface Outposts. As an initial proof of concept, the team has decided to move forward with five versions of the outposts. Ultimately with this system, we’ll be able to create a large number of outposts with different layouts and purposes, but first, the systems, props, and placement of planets need to work as intended. The Truck Stop is our first test of modularity in Space Stations. Soon, customizable hubs will be able to create variations using add-ons and procedural prop placement which can add flavor to various rooms. The modularity of Space Stations also extends to how the rooms connect to one another through the use of pre-made flowcharts. Design is collaborating with engineers to get it functioning in-game as intended. The system design team has been continuing their work on the usables system, as well as working with the cinematics team in helping to establish the final look and feel for the conversation system. The engine team finished the physics grid refactoring, which is used to store each individual physical object in the world and to allow for fast neighbour queries. The old legacy CryPhysics grid system worked by projecting the entire world onto a fixed 2d array of cells of uniform dimension. For memory reasons, the old system was configured to huge cell sizes to allow for our massive worlds, which lead to severe performance problems when dealing with lots of small objects as well as lots of entities returned due to the fact the grid would ‘wrap-around’ every few thousand kilometres. To address these issues, the new grid system was designed to have a sparse and fixed hierarchy of nested 3D grid cells of various sizes where objects will get inserted into different levels of the fixed hierarchy depending on their size. That way, the engine can efficiently handle objects the size of a planet (several thousand kilometres in radius) all the way down to small pebbles just a few centimeters across. Initial performance tests in Stanton have proven the new grid to be vastly more efficient (10x less entities returned for small queries, and queries in general faster in the magnitude of 1.2x – 2x) while using slightly more memory than the legacy system. The team has also been developing the core foundation of our AI movement. While motion capture animation is perfect for cut-scenes and all types of linear animations where things are fixed and predictable, mocap-data can’t be used directly for animations that need to be truly interactive. To use mocap-data in interactive situations, longer motion-clips must be broken into shorter clips and generated into multiple variations of the same motion-style. As an example, a simple walk-cycle needs the ability to walk at different speeds, walk in circles, walk on slopes, and walk in different directions. A typical AI-character in Squadron might have about 1000 of these motion-clips. It’s impossible to create unique animations-clips for every given situation. That’s why we developed a blending technique called Parametric Blending. Parametric Blending enables all these clips to be controllable at runtime. It takes the concept of “simple” animation-blending and moves it to the next level. The goal is to make the outcome of a transition or an interpolation predictable for an undefined number of assets. Each motion-clip contains a combination of physical and stylistic properties (what we call the “natural” motion-parameters, because they are inherently part of the motion itself). To control a character in a game, these “natural” motion-parameters need to be passed to the animation-system, and let it generate the motion we need. Once there are enough animation-clips, they’re placed into a blend-space. The most important aspect of a blend-space is that each animation-clip represents a point in a coordinate-system and all points are connected by an index list. In a blend-space, blending is treated as a geometrical problem. The relationship between animation-clips is extremely important for the blending to work. The placement of the assets into the blend-space is fully automatic due to how the animators set up their locators before export. In a single blend-space, there can be more than 100 unique animation-clips and they can be controlled like a single animation. In a 2D blendspace, the travel-speed is on the X and the turn-speed is on the Y. This means we can generate all motions between a slow-walk and fast-walk while maintaining the correct turn-speeds. Blend-spaces are not only limited to simple motion-cycles, they’ll be used for most AI motions in our vast universe, enabling our AI-characters to move fluidly and realistically in the world. 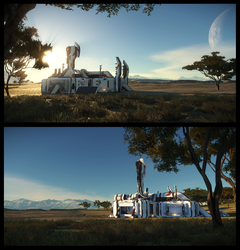 The engine team also did improvements to the objects blending with terrain. The underlying terrain and objects shapes are now taken into account to blend procedurally distributed objects more naturally with the planetary generated environment. The QA team has been testing the Loadout Editor. The Loadout Editor is heavily used by our devs across all four locations, so it made sense to increase the depth of testing on a daily basis. The first version of the Solar System Editor (also known by its shortened name: SolEd) is being tested as well. The Engineers went over SolEd’s functionality and gathered initial feedback from the team. QA documented the feedback and will work closely with the engineers on the best ways to address and test specific feedback in the near future. They also supported the Engine team with testing of a few things such as the updated Planet Physics grid and the Refactoring of Texture Streamer logic. The AI team this month completed some work on Mission related functionalities for both the PU and Squadron 42 designers. They also improved the setup for complex conversation scenarios, where multiple characters need to interact with one another. The first step to achieve that was to allow the subsumption logic to run on top of players. That allows logic on predefined story scenes to be executed and also ensures the AI system can fully communicate with players and interact with them. The subsumption tool also had some improvements on the conversation setup. The team also kicked off work on “Conversation Sub Activities.” The sub-activities describe the logic for multiple characters in one view, to make it easier for designers to synchronize interactions between the characters and the environment. Essentially, those conversations will still result in unique sub activities that run on the different characters so that each individual entity can still handle further events/situations on their own. The first pass on refactoring of the perception for the spaceships was also completed. There is currently a general perception component on characters that can handle several types of senses. A normal Human will have his own vision and hearing senses, but once sitting down inside a spaceship, they will also be able to interface with the spaceship radar and group the information about the different senses into its perception component. This will allow for progress towards more “character-controlled” behaviors on spaceships, since strict dependencies between the game code and specific behaviors running on the vehicles themselves will be removed. The cinematics team is making steady progress across multiple chapters, from implementing new scenes to polishing existing ones. The team also assisted in defining the look of the conversation system and participated in the various sprints push this system along. The goal is to allow for a cinematic feel while still maintaining flexibility and immersion. The VFX team in Frankfurt has continued working on planetary effects. The systems for implementation have been progressing nicely thanks to the close collaboration between the VFX artists and Engineers. They started implementing some of the new effects on the planets, including various atmosphere and weather effects, as well as more specific effects for various types of assets that will be distributed with the object scattering system. The Frankfurt environment team has been primarily focused on finalizing the Crusader’s moons. The procedural assets distribution system has seen a lot of progress and is still improving. All the separate pieces that make-up our procedural planets and moons are truly starting to fall into place. The team is now moving on to get the Levski landing zone integrated onto Delamar and will be the first big landing zone on a procedural entity. This means a new procedural planet/asteroid and the exteriors architecture of Levski will be created. The challenge is to merge the procedural terrain and the landing zone in a way in which they feel like they belong together. This month, Turbulent launched spectrum 0.3.2, which includes major performance updates to help render messages and threads in the client. Hopefully, this will allow users to switch faster between lobbies and channels, as well as take less CPU and render time than in the 0.3.1 version. 0.3.2 also brings two new features. First users can now re-order communities in the top left of the sidebar by dragging and dropping the community to the new location.Second, the other feature is the channel thread list, so now threads that contain media information and videos have thumbnail images allowing users to preview the content. There has also been mobile optimization and keyboard fixes that will hopefully be ready for 0.3.3. This should fix bugs Android users have been encountering when typing into the chat. The new patch also adds nested threads to the forums Users can now create a new thread and change a discussion type from a classic chronological timeline into a nested discussion. This gives us two benefits. First, we can now sort by up votes and get a nested reply tree behind it. Second, users can gain more control into choosing discussion types. The post creator will have the option of choosing if it’s a nested thread or not. Turbulent will also archive the old forums on Friday, April 14. We’ve expanded our category list to bring all those discussions from the old forum to Spectrum. This will not be an import, but a recreation inside the new system. This month, the team also worked on the new delta patcher. Turbulent is responsible for building the actual application that hosts the patching libraries, so we’ve worked hard over this month to get this new application setup. It requires a whole new application stack called Electron which lets the team patch the game data with this new launcher internally. Another major project started this month is a redesign of some of the elements of the RSI site. This is a massive overhaul of the website to address how it caters to new users. We can’t talk much about it now, but there will be updates as the design progresses. There has also been progress on updating the Ship Stats page. The ship stats are supposed to reflect the intent design of a ship and not necessarily the exact stats that are currently in game, but at the same time, there are things that are missing. The team is changing how the back end manages this by re-designing some of the tech view, specifications view, and holoviewer. Some of our devs attended Austin’s biggest media festival, South by Southwest, and participated in a special panel last month. Before that, Community Manager Jared Huckaby and Lead Community Manager Tyler Witkin attended PAX East where they got some hands on time with our incredible backers. CIG team members haven’t been back to meet our East Coast backers since 2014, so it was good to visit again. In addition to meeting many content creators at the PAX event itself, they were also able to attend a Boston Bar Citizen with fans from all over. The importance of these events cannot be understated, as they’re not only a great chance for you to meet the team, but it really energizes the team to directly interface with all of you. And speaking of Bar Citizens, the team was also honored to attend meet-ups in Brisbane, Australia; Austin, Texas; and Santa Monica, California. There are Bar Citizens happening every week. Learn more about them here. Subscribers this month saw the Space Station flair series begin in addition to receiving their very own Big Benny’s machine as part of the annual Subscription update. The March Jump Point was also released with a focus on the Anvil Hurricane. The issue also includes plenty of lore, part of an original Star Citizen serial, and more! On Citizens of the Stars, the team checked in with some of the best screenshot artists, original video makers, and news reporters in the community while also spotlighting plenty of other backer projects. Don’t forget, if you’re a subscriber you can contribute questions to Quantum Questions and vote for which ones are asked to the weekly development guests. Check out the thread in the Subscriber’s Den on Spectrum. During this month’s Happy Hours, the team showed how our designers prototype new systems by building a basketball game mockup live, and our very own Ben Lesnick took a dive into Chris Roberts’ Privateer to talk about how this classic game has influenced Star Citizen. Star Citizen joined the worldwide celebration of Space Week with many developers, including Sean Tracy and Erin Roberts, appearing on the Twitch front page to talk about the worlds being built in Star Citizen.The team at Turbulent also held a live Town Hall to answer questions about Spectrum and their other platform work. Spectrum continues to update with more functionality on the horizon. As of today, old forums are being closed and archived. Posts will still be available to read, but Spectrum will be the new home for any future discussions. Last week, the team held a special ‘Drake-over’ sale to celebrate the Buccaneer being flight-ready. With the Dragonfly and Cutlass finishing up, the current Drake lineup is almost done. Also on the ship front, a lot of work has been put into our next reveal, the Banu Defender. Stay tuned to learn more about both the Defender and the Banu race! Additionally, an update to the Referral Program is in progress. Expect to hear more about this soon, including details on a special contest.